Hello. I am a children’s author, and I recently released my second picture book. Although it is my second book, I am relatively new to blogging and publishing, so it is a challenge to solicit reviews. Friends and family will be “officially” introduced to my new book at the launch party on December 4. I value their input, but I’d also like to get reviews from people outside of my support circle. If you are interested in reviewing my book on Amazon, Goodreads, or your blog, Please contact me via the comments or at dmeastman (at) msn (dot) com to receive a PDF review copy. Here is a little more information about the book and author. Michelle Eastman is the author of ‘Dust Fairy Tales: Absolutely Aggie’ as well as ‘The Legend of Dust Bunnies, a Fairy’s Tale’. 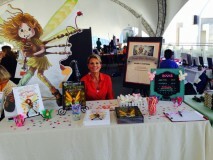 Michelle’s books take a lighthearted approach to the compelling desire kids have to fit-in. The stories validate the need kids feel for acceptance, while imparting a gentle take-away message of the joy that can come from embracing one’s individuality. The lively, rhyming stanzas and vivid illustrations appeal to boys and girls alike. Michelle began her career as an elementary teacher in the West Des Moines School District. At Iowa Public Television, she wrote educational content for teachers and students. Her work with children, and passion for picture books, inspired her to found the literacy initiative, Picture Book Pass it On (#PBPiO). When she’s not chasing dust bunnies, or her two cats, she likes to cuddle up with a good book and her son. Michelle lives with her husband and son, in Waukee, Iowa. If you have any tips or advice for seeking reviews, or helpful resources, I would love to hear from you. I enjoy connecting with fellow authors. I’m on Twitter, Goodreads, and Facebook. Thank you for your time. Fairies, Music, and Dust! Oh, my! I am excited to be publishing my second children’s book. I created this short preview video, and I would love to hear your thoughts. Thank you! Fairies, music, and dust! Oh my! Aggie is a little Dust Fairy with a big problem. She wants to join the fairy band, but they do not approve of her offbeat style. Aggie is determined to impress them, but that turns out to be harder than she imagined. Just when she thinks she will never find a way to fit in, Aggie discovers it might be more fun to stand out. Lively, rhyming stanzas and vibrant illustrations come together in this magical tale. The story is sure to delight boys and girls alike, while imparting a positive message about embracing one’s individuality.